Margate Rocks on Sunday 4 May. Click for details. 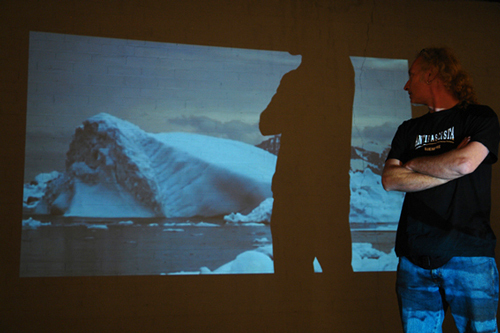 Breathing Berg is one of a series of short films made as a result of an Arts council/ British Antarctic Survey sponsored residency in Antarctica. Most of the information coming out of Antarctica is scientific data monitoring the rate and implications of climate change, it is rigorously devoid of subjectivity. I felt a freedom as an artist to explore creatively the extraordinary world around me, and yet I was aware that the environment needed very little in the way of intervention, it already had its own voice; all it needed was a quiet witness. Most people watching Breathing berg for the first time make an assumption that it has been digitally manipulated. We have grown so accustomed to the slick tricks of the advertising industry that we find it hard to believe that something so unworldly can in fact be real. My part in making the film was to be a bystander with a film camera and make the decision to overlay the sound. Antarctica is a hard place in which to be a human being and I wanted to reflect this without being too interventionary.